As fans of the comedy series "Portlandia'' know, the secret to merchandising is to slap a bird on it. And apparently, the same holds true for baseball uniforms. After four rounds of voting, tigers, fish, elephants, snakes, astronauts, seafarers, gun-toting officers of the law, buccaneers, heavenly bodies, Native Americans, pinstriped Northeners and even two pairs of colored socks are all gone. 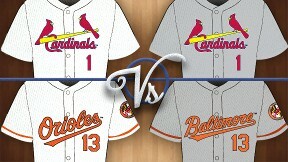 Our Battle of the Uniforms will finish with the Battle of the Birds. The No. 1-seeded Cardinals, who have as iconic a St. Louis design as the Gateway Arch or a bottle of Bud, beat their longtime rival, the Chicago Cubs, in the final round of the National League voting, 54 percent to 46 percent. Meanwhile, the Cinderella team of the American League bracket upset yet another higher-seeded team in the AL championship. By a margin of 3,103 votes, fans declared they prefer the orange and black Baltimore Orioles over the traditional uniform worn by everyone from Babe Ruth to Derek Jeter. Or perhaps fans just hate the Yankees' pinstripes. 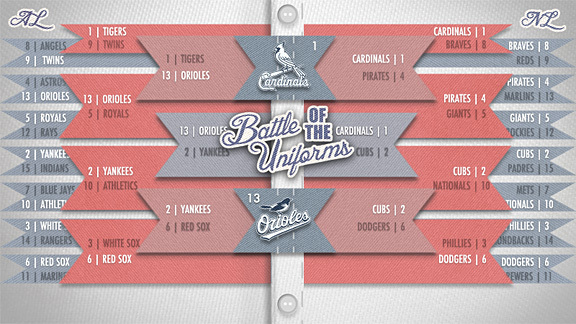 Whatever the reason, it's the Cardinals versus the Orioles for the title of baseball's best uniform. Bird watchers should get their binoculars out for this ornithological fight, though Toronto fans are probably wondering why their colorful Jay was found wanting. This is serious business, so to make sure that everyone gets a chance to take a long, careful look at these two uniforms and judge the colors, logos, caps and overall style of both home and road uniforms, our polls will be open throughout the weekend. You can cast your vote up until noon ET Monday, when we will declare the winner. So good luck Cardinals and Orioles. May the better uniform win. And remember voters, this isn't about who actually wears the uniforms but the uniforms themselves. Note: Championship-round poll closes at noon ET Monday. Audubon would have loved this championship. 6. I like the traditional home jersey; also a fan of the road jerseys (but preferred when there were no names on back). One of the fundamental mysteries of the uni-verse: Why are the Dodgers' front uni numbers red when there's no other red in their uniform set?